Edward of Westminster (13 October 1453 – 4 May 1471), also known as Edward of Lancaster, was the only son of King Henry VI of England and Margaret of Anjou. He was killed at the Battle of Tewkesbury, making him the only heir apparent to the English throne to die in battle. Edward was born at the Palace of Westminster, London, the only son of King Henry VI of England and his wife, Margaret of Anjou. At the time, there was strife between Henry's supporters and those of Richard Plantagenet, 3rd Duke of York, who had a claim to the throne and challenged the authority of Henry's officers of state. 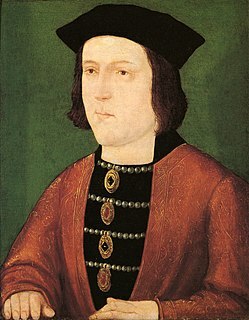 Henry was suffering from mental illness, and there were widespread rumours that the prince was the result of an affair between his mother and one of her loyal supporters. Edmund Beaufort, 2nd Duke of Somerset and James Butler, 5th Earl of Ormonde, were both suspected of fathering Prince Edward; however, there is no firm evidence to support the rumours, and Henry himself never doubted the boy's legitimacy and publicly acknowledged paternity. Edward was invested as Prince of Wales at Windsor Castle in 1454. In 1460, King Henry was captured by the supporters of the Duke of York at the Battle of Northampton and taken to London. The Duke of York was dissuaded from claiming the throne immediately but he induced Parliament to pass the Act of Accord, by which Henry was allowed to reign but Edward was disinherited, as York or his heirs would become king on Henry's death. Queen Margaret and Edward had meanwhile fled through Cheshire. By Margaret's later account, she induced outlaws and pillagers to aid her by pledging them to recognise the seven-year-old Edward as rightful heir to the crown. They subsequently reached safety in Wales and journeyed to Scotland, where Margaret raised support, while the Duke of York's enemies gathered in the north of England. After York was killed at the Battle of Wakefield, the large army which Margaret had gathered advanced south. They defeated the army of Richard Neville, 16th Earl of Warwick, one of York's most prominent supporters, at the Second Battle of St Albans. Warwick brought the captive King Henry in the train of his army, and he was found abandoned on the battlefield. Two of Warwick's knights, William Bonville, 1st Baron Bonville, and Sir Thomas Kyriell, who had agreed to remain with Henry and see that he came to no harm, were captured. The day after the battle, Margaret asked Edward what death the two knights should suffer. Edward readily replied that their heads should be cut off. After several years in exile, Margaret took the best opportunity that presented itself and allied herself with the renegade Earl of Warwick. King Louis XI of France wanted to start a war with Burgundy, allies of the Yorkist King Edward IV. He believed if he allied himself to restoring Lancastrian rule they would help him conquer Burgundy. As a compliment to his new allies Louis made young Edward godfather to his son Charles. Prince Edward was married to Anne Neville, Warwick's younger daughter, in December 1470, though there is some doubt as to whether the marriage was ever consummated. Warwick returned to England and deposed Edward IV, with the help of Edward IV's younger brother, the Duke of Clarence. Edward IV fled into exile to Burgundy with his youngest brother the Duke of Gloucester, while Warwick restored Henry VI to the throne. 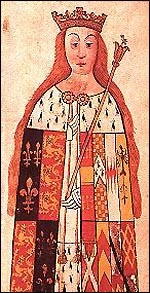 Anne Neville, wife of Edward of Westminster and later of Richard III. Edward and Margaret lingered behind in France until April 1471. However, Edward IV had already raised an army, returned to England, and reconciled with Clarence. On the same day Margaret and Edward landed in England (14 April), Edward IV defeated and killed Warwick at the Battle of Barnet. With little real hope of success, the inexperienced prince and his mother led the remnant of their forces to meet Edward IV in the Battle of Tewkesbury. They were defeated and Edward was killed. According to some accounts, shortly after the rout of the Lancastrians at Tewkesbury, a small contingent of men under the Duke of Clarence found the grieving prince near a grove, and immediately beheaded him on a makeshift block, despite his pleas. Paul Murray Kendall, a biographer of Richard III, accepts this version of events. Another account of Edward's death is given by three Tudor sources: The Grand Chronicle of London, Polydore Vergil, and Edward Hall. It was later dramatised by William Shakespeare in Henry VI, Part 3, Act V, scene v. Their story is that Edward was captured and brought before the victorious Edward IV and his brothers and followers. The king received the prince graciously, and asked him why he had taken up arms against him. The prince replied defiantly, "I came to recover my father's heritage." The king then struck the prince across his face with his gauntlet hand, and his brothers killed the prince with their swords. However, none of these accounts appear in any of the contemporaneous sources, which all report that Edward died in battle. Edward's body is buried at Tewkesbury Abbey. His widow, Anne Neville, married the Duke of Gloucester, who eventually succeeded as King Richard III in 1483. "Here lies Edward, Prince of Wales, cruelly slain whilst but a youth. Anno Domini 1471, May fourth. Alas, the savagery of men. Thou art the sole light of thy Mother, and the last hope of thy race." ^ Churchill, Winston (1956). A History of the English-Speaking Peoples: Vol1 The Birth of Britain. Cassell. p. 328. ISBN 0-304-29500-0.